Just over 80 years ago, on 4 October 1929,Table Mountain Aerial Cableway Company (TMACC) was officially opened by Rev A J S Lewis, the then presiding Mayor of Cape Town. Since then more than 20 million people have had the honor of reaching the top of this enchanting mountain by cable car. Annually an estimated 800,000 people use the Cableway. 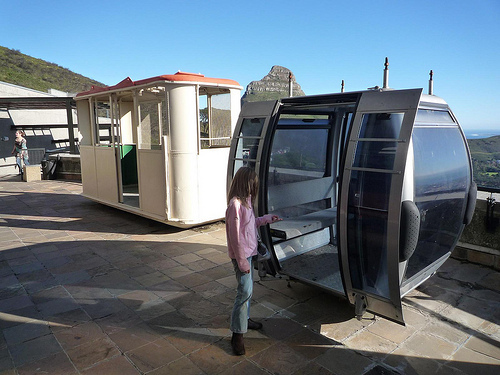 Today, after its third upgrade since its inception, Table Mountain Cableway uses a replica of the cable cars used on the slopes of Mount Titles in Switzerland. These round cars transport up to 65 passengers at a time which has alleviated the problem of long waiting times significantly. The cars have a maximum carrying capacity of five tons and the cars themselves weigh 13 tons each. The cable cars work on a counter weight system weighing 134 tons each.There are actually two cable cars that work in unison.When one car goes up the other car comes down and they can not work independently from each other. To ensure that the cars are never overloaded the cable cars have a built-in scale. It is recommended that you watch the video to get a better understanding of the counter weight system that the cable cars operate on. The base of the cable car can carry up to 4000 liters of water and is in actual fact a water tank. This water is used not only to ballast during the windy season but also as a supply of fresh water for visitors. How long does it take to reach the top? A trip up Table Mountain in these cable cars takes between 5 and 10 minutes, traveling at a speed of up to 10 meters a second. Table Mountain at its highest point is 1085meters.The cables weigh 18 tons and are 1200m in length. The cars have a revolving floor which allow the visitors a 360° view of the mountains and the surrounds when traveling up and down the mountain. The new cars are designed to withstand even the harshest Cape weather. I personally remember going up Table Mountain in one of these cable cars. You cannot compare them with the new cable cars! The first few attempts at providing the general public with a means to explore this natural wonder were waylaid by war. These plans did not involve a cable car but there were plans to build a funicular railway line to the top of the mountain. This would mean that a railway carriage would basically be pulled up the slope of the mountain by means of a cable. The outbreak of the First World War caused these plans to be halted. 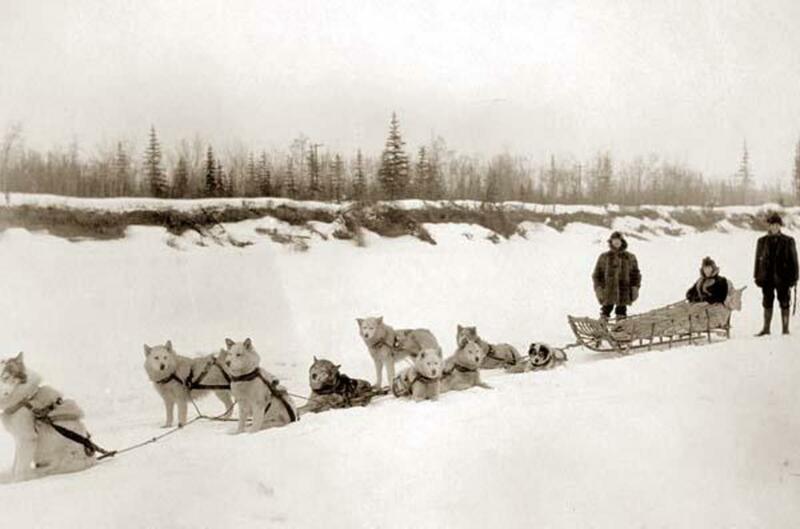 The first plans for a Cableway were presented by a Norwegian engineer Trygve Stromsoe, in 1926. 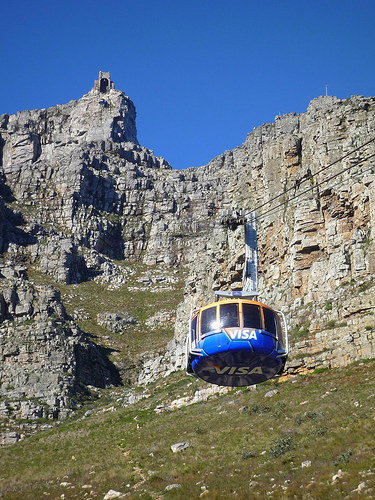 Recognizing the business potential in this innovative idea a group of eminent businessmen joined forces and formed the Table Mountain Aerial Cableway Company (TMACC) to finance the construction of the Cableway. Before construction work could commence an approach road had to be built to gain access to the lower station. This road was almost one mile long. To enable the construction workers to get building material to the top of the mountain at the site of the upper station a temporary cableway had to be erected. A pump station had to be built to provide water supplies for both stations as well as a one mile long railway line for the transporting of building stone from a quarry on the mountain. In December 1927 work on the lower station was able to commence and six months later work on the upper station was started. Work on the Cableway was eventually completed and the very first full sized car made its debut journey to the summit on 9 August 1929. The engineer and mastermind behind the Cableway Mr T. Strömsoe was joined by the chairman of TMACC and his wife, Mr Sidney Benjamin and councillor D Bean on this historic occasion.When the Table Mountain Cableway first opened its doors for business the cars had a carrying capacity of 20 people. Since then the Cableway has carried some of Cape Town's most illustrious visitors, including King George VI and Queen Elizabeth II, as well as , Prince Andrew, Margaret Thatcher, Sting, Stefi Graf, Oprah Winfrey, Micheal Schumacher, , Micheal Buble, , Jackie Chan, Skunk Anansie, Tina Turner, Paul Oakenfold, Brooke Shields and Arnold Schwarzenneger. The company changed ownership in 1993 and the new owners immediately set a plan in motion to upgrade the then somewhat out-dated Cableway. The upgrade included the machinery and restaurants but the most significant upgrade was to the cable cars. 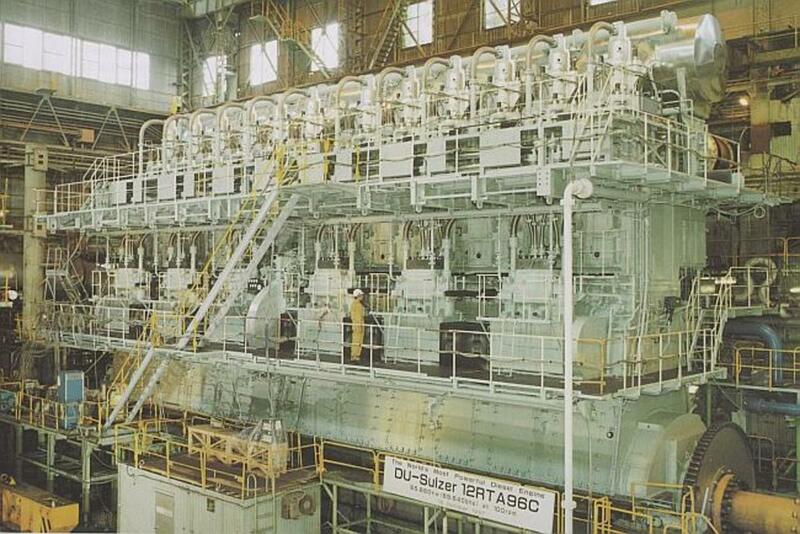 In January 1997 work on the upgrade was started and lasted for several months The entire project cost R87 million, but the end result has really paid off. Exactly sixty eight years, to the date, after the initial opening of the Cableway the new Cableway was officially opened on 4 October 1977. 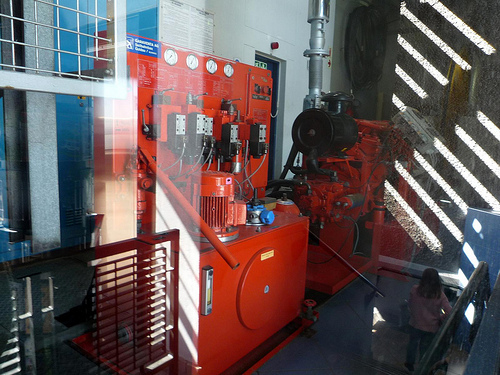 The upgrade included the introduction of viewing decks, pathways and a larger water reservoir. To accommodate the new cars the upper docking bays had to be widened and the lower station was rebuilt. 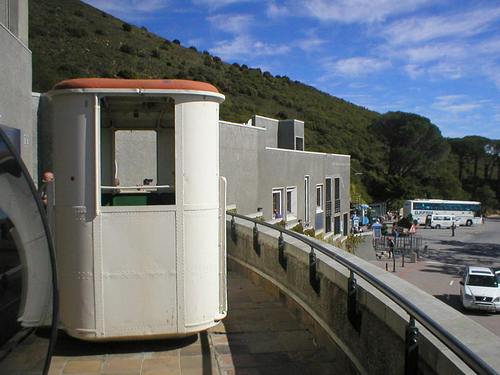 The lower station would now house the Cableway's driving system to allow for more public viewing space on the top of the mountain. A bar, bistro and restaurant and curios shop were also added to accommodate the needs of visitors. What Makes Table Mountain So Special? 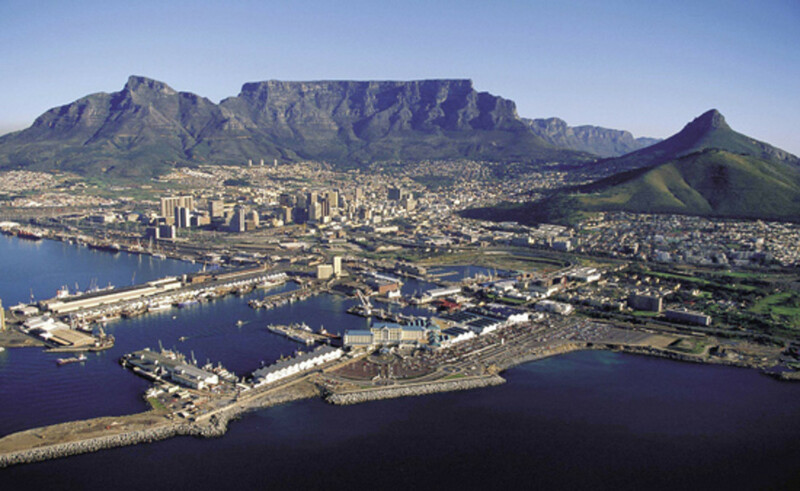 Table Mountain is an iconic landmark to one of the most beautiful cities in the world. 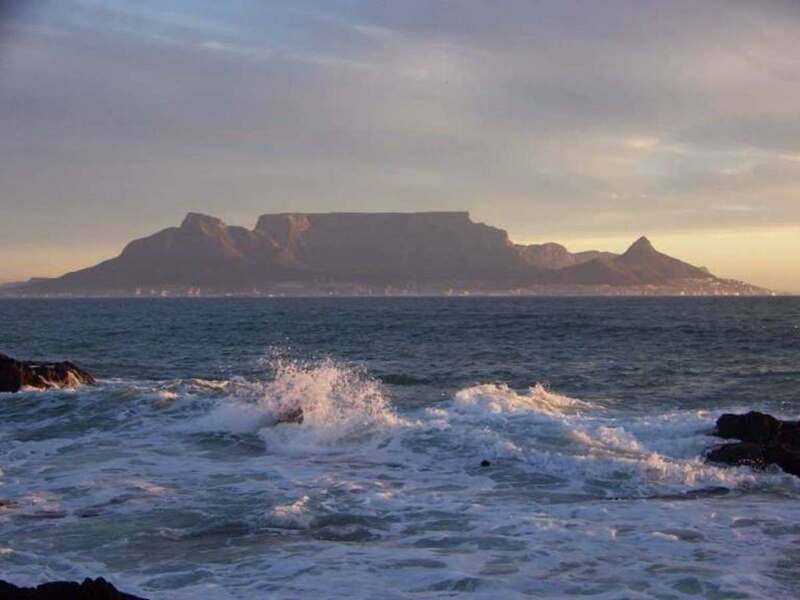 MSN Travel UK votes Table Mountain as one of "50 Places to See Before You Die" .I disagree - it's a place you should visit as many times as possible before you die. 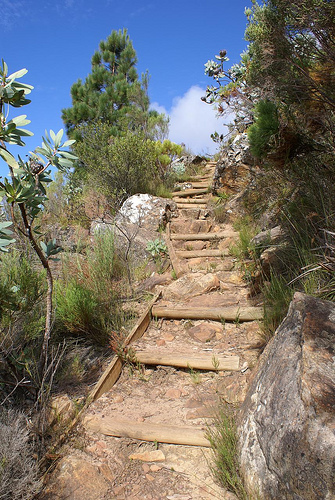 Each time you go up Table Mountain you see something unique and wonderful. Few other cities have a natural backdrop as beautiful and immense as Table Mountain. What people miss if they do not visit Table Mountain is what you don't see on postcards. 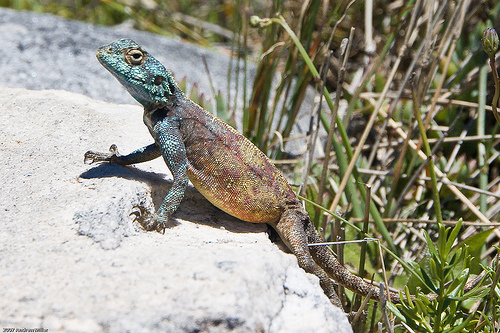 The unspoilt natural wonderland with bizarre rock formations and clear mountain streams and the unique rich fauna and flora as well as the countless breathtaking views from the top of Table Mountain. 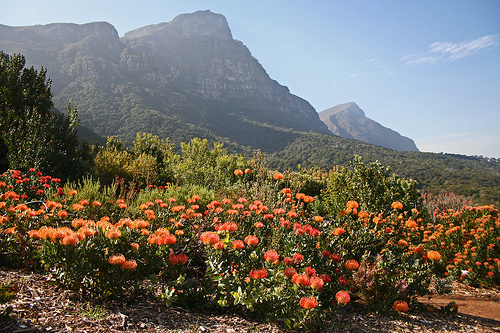 Table Mountain is home to over 1500 species of plants. and birds in abundance. 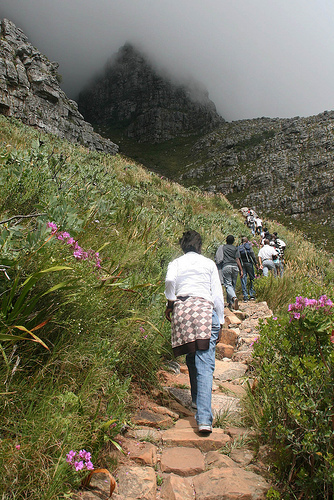 Table Mountain falls under the protection of the Table Mountain National Park which is recognized internationally. If you are wondering when would be the best time to take that trip on the Table Mountain Cable car here is a bit of advice. Firstly the Cableway is only open when the weather is suitable for the use of the cableway. As Cape Town is in a winter rainfall region your chances of the Cableway being open is therefore better in the summer months from November to April. If its your birthday when you are in Cape Town make the most of your special day. 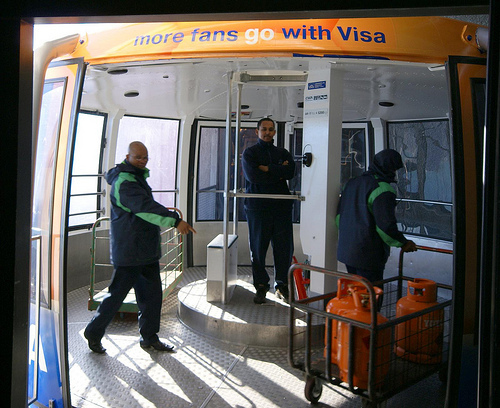 Take your Identity document with you and visit the Cableway. TMACC gives anyone that can offer proof of their birthday a free trip up the mountain on the day of their birthday. 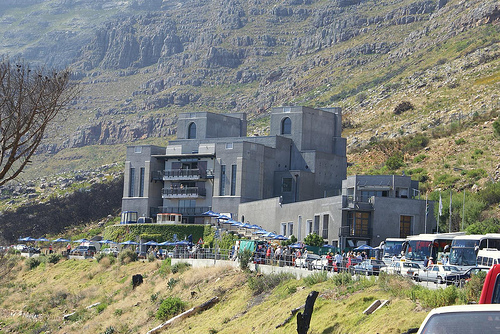 Table Mountain Aerial Cableway Company introduced “Kidz Season” on 1 May 2011. This season will last until 31 October 2011. 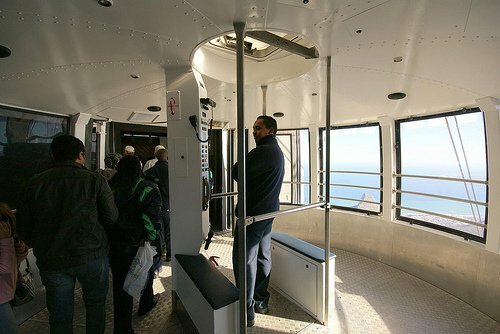 During this period visitors to the Table Mountain Cableway will qualify for two free tickets for children under the age of eighteen when they are accompanied by a full-paying adult who has purchased a return ticket. This special offer is valid throughout this period including weekends, public holidays and during school holidays. On November 10 2010 the winner of the Imvelo Award for Responsible Tourism will be announced and all the stakeholders of Table Mountain Cableway company, as a nominee for this award, will be waiting for the results with baited breath. The Imvelo Award for Responsible Tourism recognizes and rewards sustainable business practice. Criteria used for assessing the measure of responsible tourism include the degree of involvement of local people as well as the ability to generate economic benefits for host communities. The nominees are also judged on their contributions in minimizing negative economic, social and environmental impact and equally as important are their contributions towards conserving natural and cultural heritages. 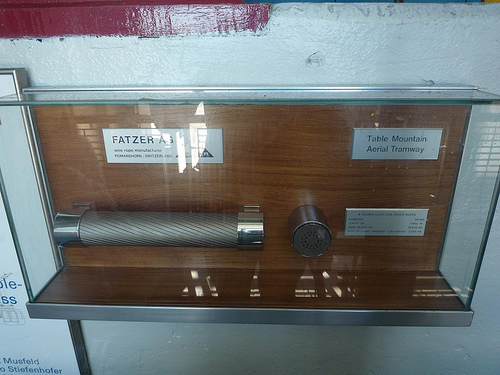 Should Table Mountain Cableway receive this coveted award it will not be the first Imvelo Award for Responsible Tourism that has been bestowed upon this company. 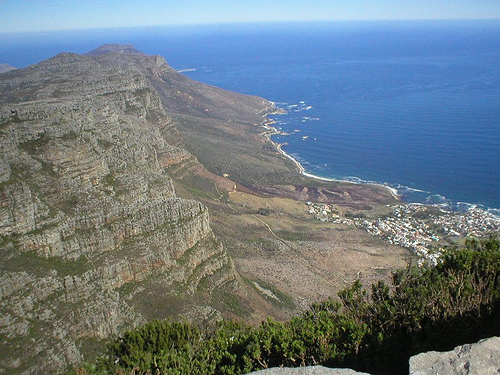 The Table Mountain Cableway received the Imvelo Award for the Best Single Resource Management in 2008 in recognition for their superior management of water. In an effort to conserve this precious commodity the Cableway company as well as the Table Mountain Cafe reduced water consumption on Table Mountain by over 1 million litres in the period of a year. Another water-saving innovation was the introduction of chemical toilets as far back as 1997. Let us all hope that Table Mountain Cableway walks away with this award in recognition of their efforts to promote tourism in Cape Town and conserve the natural habitat for generations to come. 1. Table Mountain was a symbol of hope to all the inmates of Robben Island. 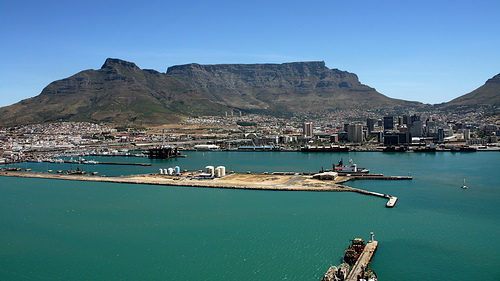 President Nelson Mandela, who spent many years in prison on Robben Island, describes Table Mountain as a gift to the world. 3. Table Mountain is the only mountain that boasts a galaxy that was named after it. Louis de Lacaille Mons named a galaxy that he studied from the top of Table Mountain Mensae, meaning “the table” in Latin. 4. The ghost frog, an endangered specie , only 6cm small is only found on Table Mountain. 5. 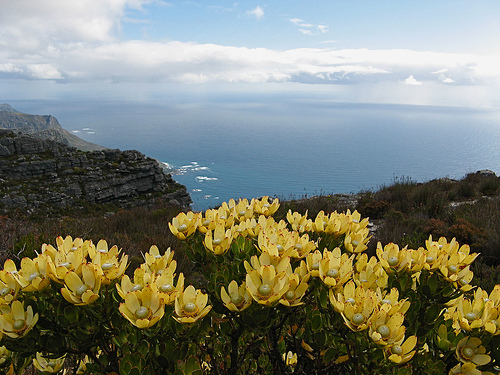 Table Mountain is part of the Cape Flower Region which boasts the richest and most diverse vegetation in the world with over 25,000 plant species. 6. 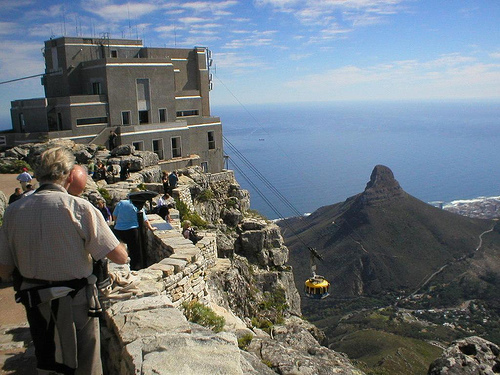 Table Mountain Cableway is one of only three in the world that have rotating cable cars. 7. Table Mountain is one of the most beautiful natural backdrops that any city could wish to have. 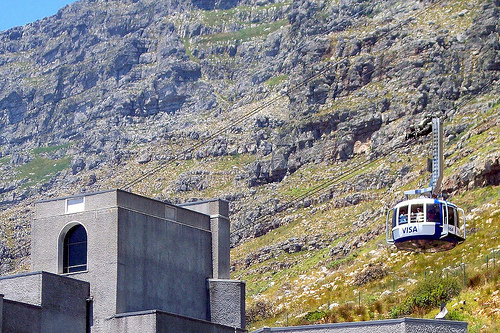 Old cable cars, Table Mountain, South Africa on Flickr - Photo Sharing! Table Mountain on Flickr - Photo Sharing! Sunset over Table Mountain on Flickr - Photo Sharing! Table Mountain Cable Car on Flickr - Photo Sharing! 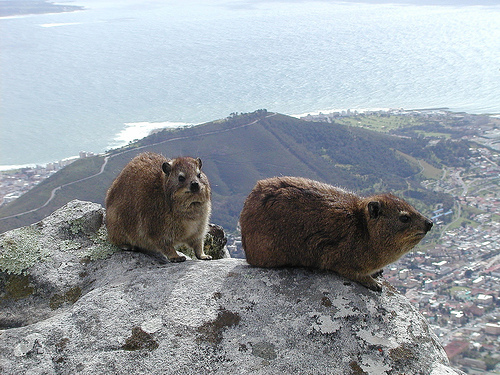 Rock dassies on Table Mountain on Flickr - Photo Sharing! 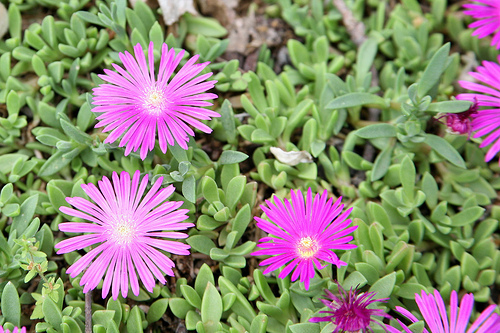 Table Mountain Iceplant (Delosperma) \'John Profitt\' on Flickr - Photo Sharing! 0503 Cape Town Table Mountain (21) on Flickr - Photo Sharing! 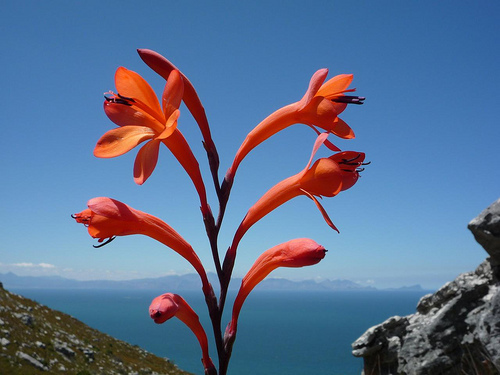 Orange "Table Mountain Watsonia" Flowers on Flickr - Photo Sharing! Above Kasteelspoort, Table Mountain on Flickr - Photo Sharing! Photo by Peter Groves. Yours truly is a little exposed. 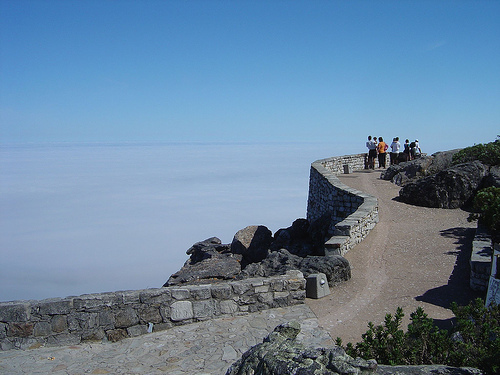 It is quite interesting to know about Table Mountain as well as Aerial Cableway. It really seems to be a great destination. I have seen Aerial Cableways in Noway, Singapore and India but the one for Table Mountain has many special features. The most interesting among others are the water facility and 360 degree view. I wish I could make a visit which does not seem to be likely at this moment. Very many thanks for sharing all this information. Thumbed up and shared. Hope you have a great day on our beautiful Table Mountain. Lovely hub. I am hoping to take the ride again on my birthday. Albert, I contacted the Table Mountain Aerial Cableway Company and they confirmed that the correct opening date was in fact 4 Octboer 1929. They did not however give any explanation regarding the other two apparently incorrect dates. One can only presume that the souvenir token company did not have the correct information and were uncertain as to which of the two incorrect dates was more correct. Turns out neither are. Thanks for visiting my site and hopefully this will inspire you to visit our majestic Table Mountain. Hi. I bought two souvenir tokens of the "Table Mountain Aerial Cableway"
When I read on the back it had two different dates for the opening. 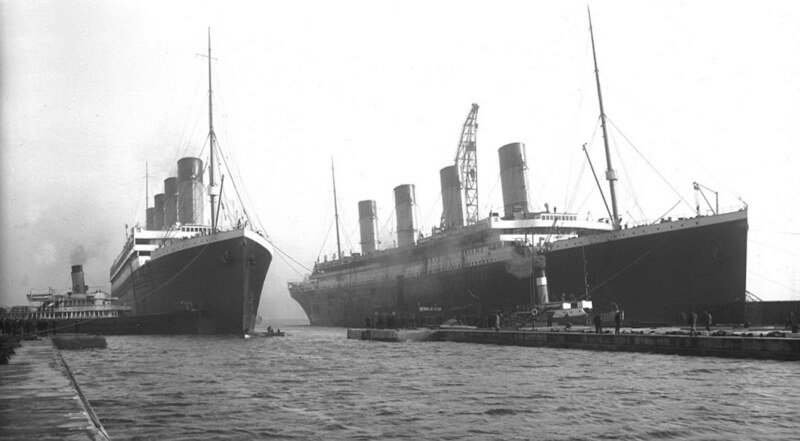 The one was the 5th while the other the 6th of October 1929. When I googled it I for a third date. 4th October 1929. What was the real date? Is there a reason for the different dates? Will write it down immediately! Hi Rquella , fellow South African! You have not seen what Cape Town has to offer if you have not rxperienced the thrill and beauty of Table Mountain - it is something that should be on every person's "bucket list"
Been in Cape Town a few times, but never had the opportunity to do the cable car thing. Tyd Faktor! Very informative hub, telling me things I did not knew about our country. Hi Laura. Dankie vir die lekker hub. Great to see another South African on Hubpages. If you're looking to drive traffic, Squidoo is also very much worthwhile. 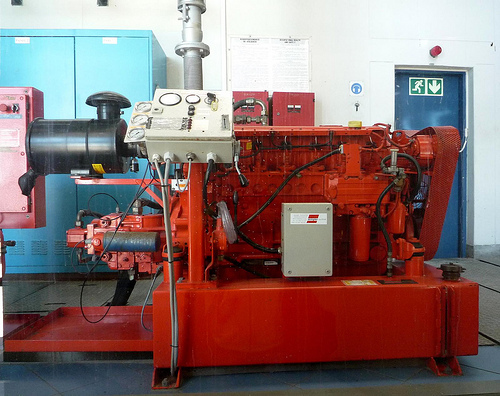 Not as user friendly but just as powerful. Also, google "submit to search engines", you'll see how easy it is to get your hubpages & site submitted to the major search engines - more traffic for you! I hope hubpages and all the adsense revenue is helping too. Alles van die beste. Thanks for stopping by Zsuzsy and glad you enjoyed the hub. 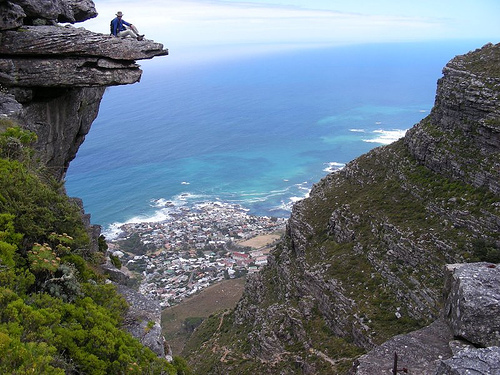 Table Mountain is just such a majestic and awesome place to be that I am sure you would forget your fear of heights if you ever had the chance to visit our beautiful mountain. Wow Laura what fabulous pictures to go with a fantastic hub. I sure would like to visit the table mountains but the cable car would be a no-no for me...heights and wobbly cars in the air and I do not mesh. Hiking on the other hand would be up my alley for sure. Thank you for sharing some of the beauties from your neck of the woods. Thanks William - Glad you found this Hub informative! So glad you enjoyed the Hub. I agree it is majestic and one of the most beautiful places in the world. I can quite believe that you must miss the beautiful city of Cape Town. Thanks a lot for this hub!. I was born in Cape-Town and went up the mountain when i was last there,13 years ago! The only word(or one of the only words)i have for it is MAJESTIC!. Thanks Habee ..... I am sure you'll forget your fear of heights when you see the fantastic scenery as seen from the cableway. Great hub...but I have a terrible fear of heights! Thanks Cosette. I was shortlisted for a financial management post at the cableway and it was the one position that I truly regret that my application was unsuccessful. The offices are at the bottom station with a view stretching for miles on end. The most vibrant and at the same time beautiful place to work! Glad it brought back good memories! Very awesome hub! A trip down memory lane for me that made me feel desperately homesick! I went up in the old ones too as a child and have more recently enjoyed the new ones. Lovely photos. There really is no place on earth like it. Thanks Paradise. Table Mountain is awesome. The whole vibe at the Cableway is exciting. I just love it there! The awesome views just make you want to go back again and again. Awesome travel hub. The hiking pics, especially. I'd be afraid to ride that cable-car thingy. Awesome pics. I'd just love to take that hike.